NOTICE: Activation key must be used on a valid Steam account, requires internet connection. 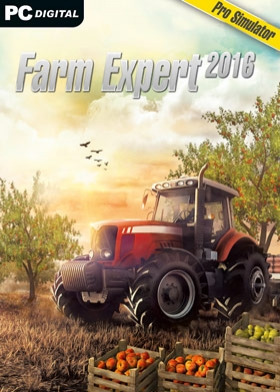 ABOUT THE GAME	Farm Expert 2016 takes the player to the countryside and gives hobby farmers full control in the comfort of their home. Farm management, cultivating fields, planting crops, animal ranching as well as buying and selling your own products and new equipment are just a few of the game element… s this State-of-the-art farm simulator offers. KEY FEATURES Successfully manage your farm. Harvest crops and fruit. Take care of your cattle and other animals. Tons of licensed machines to use. Stunning, highly detailed graphics. Realistic game physics for more authentic machine handling. Multiplayer co-op mode.SYSTEM REQUIREMENTS MINIMUM: Pentium Dual Core 2,2 processor. 4GB RAM. DirectX11 compatible, 1GB VRAM video adapter (hardware shader model 5). Windows 7, 8, 8.1 or better. Additional Notes: Laptop versions of graphics cards may work but are NOT officially supported.RECOMMENDED: Pentium dual core 3,2 processor. 8GB RAM. DirectX11 compatible, 2GB VRAM video adapter (hardware shader model 5), the faster the better. Windows 7, 8, 8.1 or better. Additional Notes: Laptop versions of graphics cards may work but are NOT officially supported.